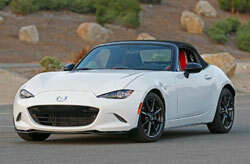 Racing Beat has been at the heart Mazda performance products since 1971. For the Miata we offer one of the most extensive selections of Miata performance and appearance products available from any one manufacturer. Racing Beat's signature products include an extensive offering of our Power Pulse exhaust line, Miata suspension parts, chassis, and appearance items - all designed and engineered by Racing Beat specifically for the Miata. We invite you to review our online Miata parts listings and contact us with any questions you may have regarding a specific component for your Miata. 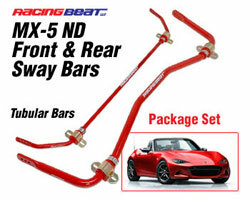 Adding a set of swaybars to your Miata is a great way to improve handling. Here are the answers to your most popular questions. Here's our list of the best Miata upgrades for your performance dollar. Not just a simple cover but complete replacement seat covers. Great price! We consider this to be the best looking nose kit on the market! It's been a top seller for years.